1 of 4 Place sliced shallot in a medium bowl and toss with 1/4 cup of the vinegar. Set aside. 2 of 4 Make dressing: In a small bowl, whisk remaining 1/4 cup vinegar, 1 tbsp of the soy sauce, the oil and sugar. 3 of 4 Heat a large nonstick skillet over medium-high heat. Crumble in beef and saute 4 minutes, breaking apart with a wooden spoon. Add minced garlic and salt; cook 1 minute. Remove to a bowl with a slotted spoon and lower heat to medium. Crack eggs into skillet and fry 3 minutes or to desired doneness. 4 of 4 Stir remaining 2 tbsp soy sauce, the scallions and chili garlic sauce into beef. 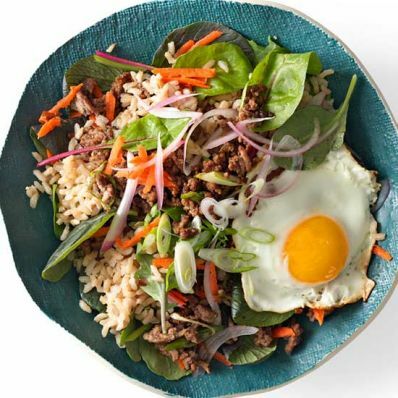 In a large bowl, toss greens with shredded carrots, marinated shallot and dressing. Divide among 4 plates and spoon rice and beef mixture over salad. Top each serving with a fried egg.